JoAnn Stratakos’ woolly, handmade sheep gives straight pins an irresistible home. Sewers and fabric crafters need pins, and pins need a place to go. 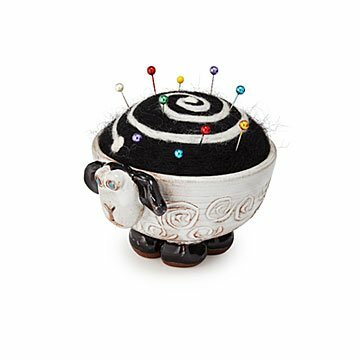 Artist JoAnn Stratakos' charming stoneware pincushion gives them a home where the woolly sheep roams. Wooliam's swirly black and white wool will hold all the straight pins you need. (Don't tell him, but he could almost pass for a porcupine that way.) Cute enough to leave out as decor, you can also stow him next to the sewing or craft box. Next time you're changing a hemline, whipping up a new outfit, or testing out a new quilt pattern, he'll be baaaaack. Handmade in Effort, Pennsylvania.